Oh how I just LOVE spring! I don’t even mind the crazy Texas thunderstorms because it only means that gorgeous flowers are blooming, as a result of all that water. Bring on the blooms! Then there’s Easter…another holiday I love…and it’s only 2 weeks away. Do you decorate a lot or not at all for Easter? Maybe you need some inspiration? 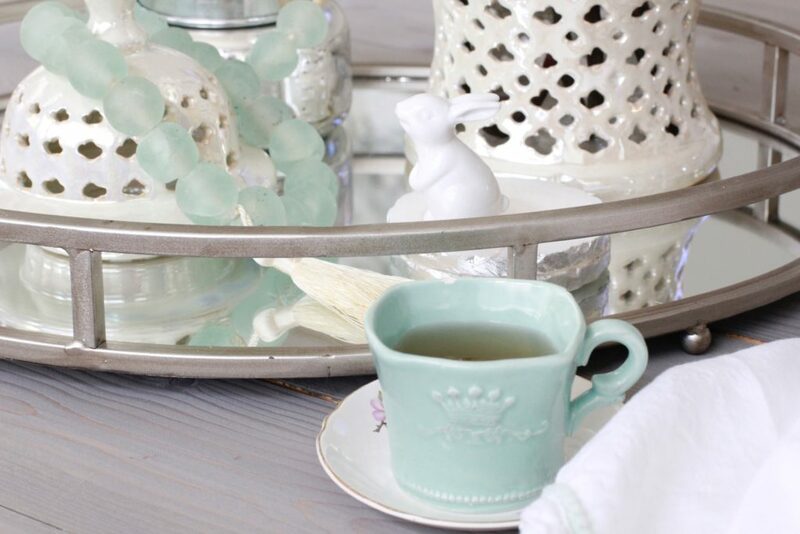 You’ve come to the right place since I’m sharing a few subtle hints of Easter decor in today’s Easter Parade Blog Hop. Welcome to all of you coming from my fabulous friend Joan’s blog, 2 Ladies and a Chair. 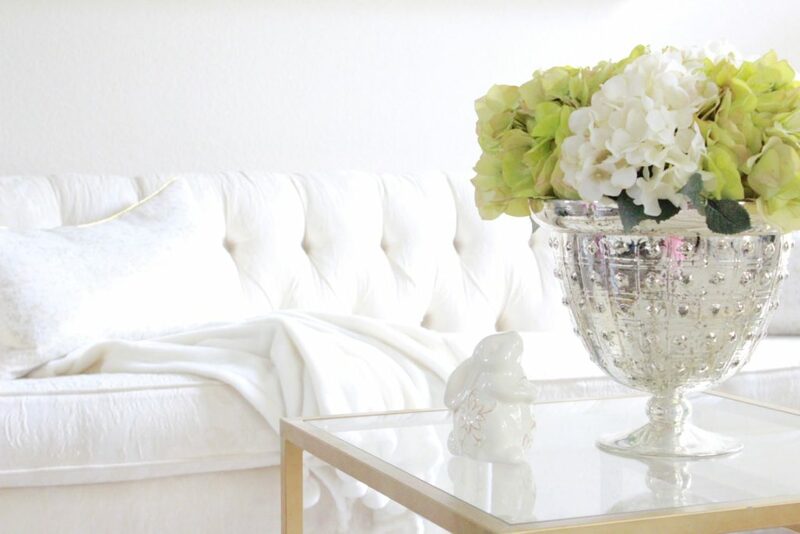 Don’t you just love her style and her home?! It’s always so gorgeous and cozy. Huge hugs to my regular readers that come back for every post. Love you guys! So, I used to have a TON of Easter decor when we were first married but over the years I got rid of most of it and I’m glad. A lot of it was given to me or something I made and there wasn’t a lot of anything I loved. So I decided to use subtle hints of Easter decor in my Spring decor. 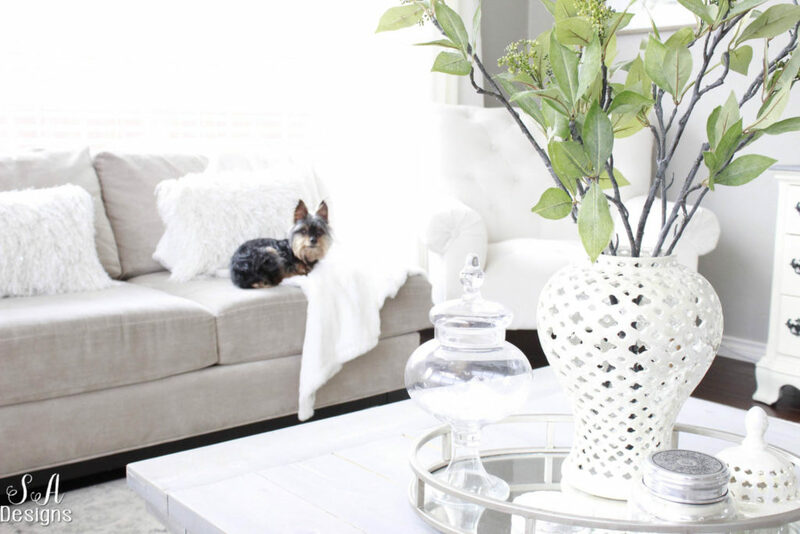 I decorated my family room coffee table with just some simple green stems this spring from my friends at AFloral (see more HERE for some of my favorite peonies from them and HERE for other fabulous floral). It was a simple way to bring in some green. 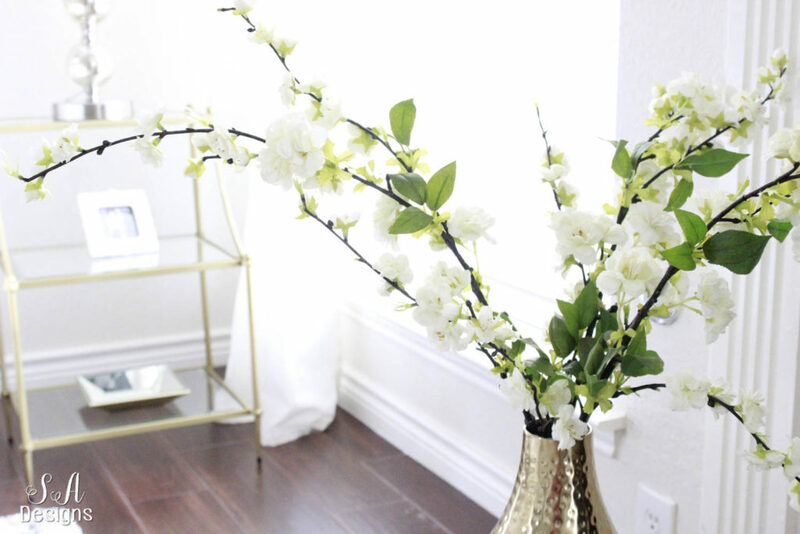 Now here are 2 other ways I’ve styled this room for the month of Easter. I hope you brought some tea with you to get cozy because I usually have herbal tea ready when guests are here. I decided to add this lovely “beach glass” color. This light aqua and just pastels in general make me think of Easter. When I was little, my mom and I would go shopping for an Easter Dress to wear on Easter Sunday. It was always something pastel. Sometimes with an Easter bonnet, sometimes white gloves and patent leather shoes and ruffle socks. The good ‘ole 80’s. I need to find a good picture but here’s a FUNNY one I just found and I’m not sure why I was wearing socks with sandals? My mother is in trouble LOL. 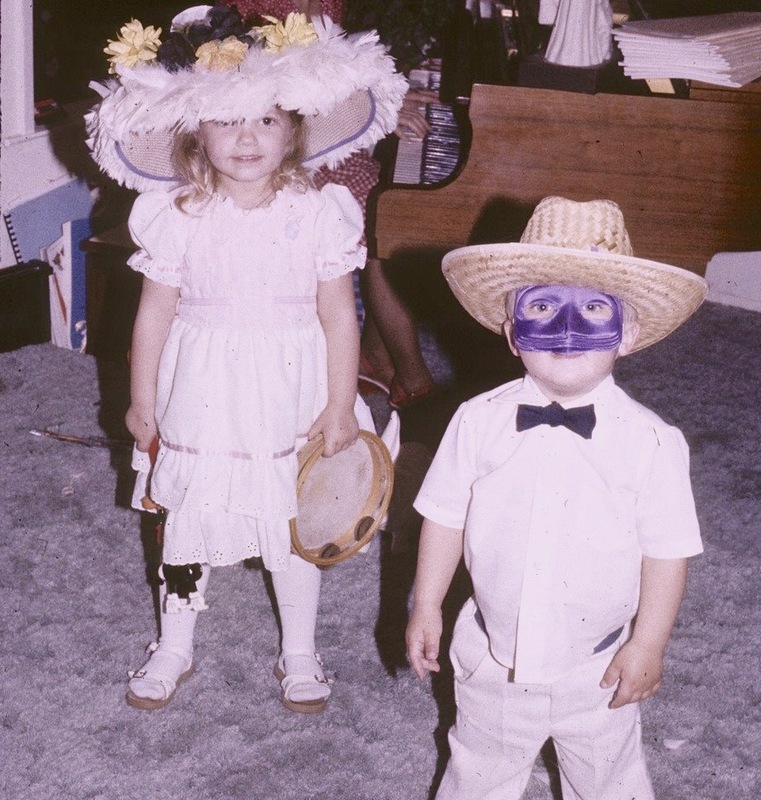 But check out that Easter bonnet or silly hat that I probably found in my grandmother’s dress-up box on this particular Easter. Circa 1982? Grandma Crosby always played the piano while we sang and danced, played instruments and…..my little brother Josh imitated Zorro? LOL I don’t know but we always had fun. Gosh, I miss my Grandma. She loved decorating for holidays and she and Grandpa Crosby would hide money in our egg hunts! That was a fast way to make cash ha! 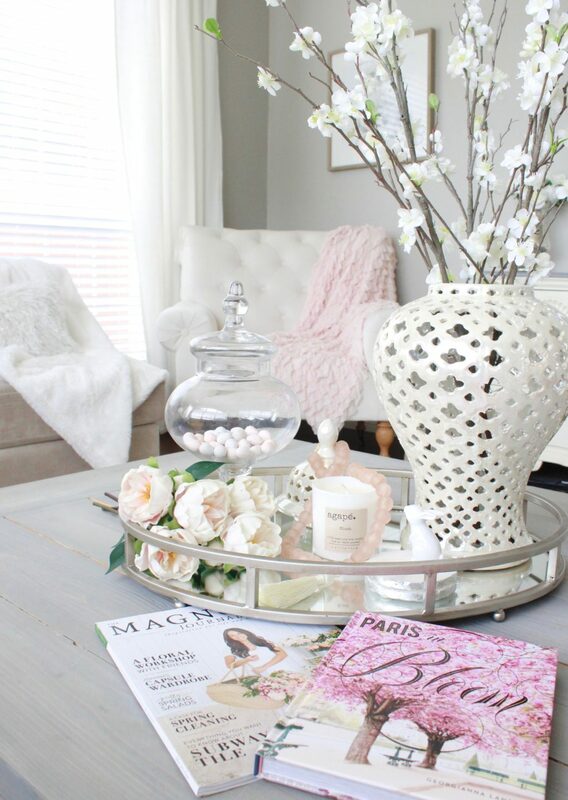 So back my decor….yes, I love these soft pastel colors. 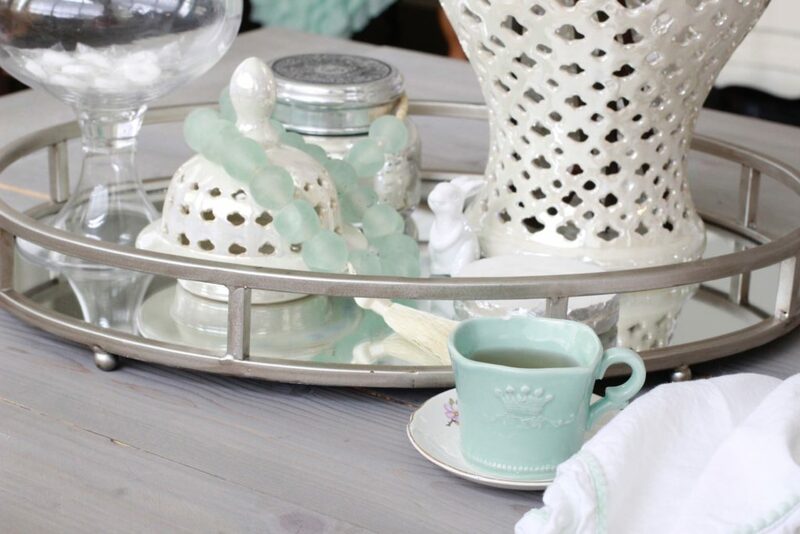 Bringing out my coordinating teacups is a way to bring in some color and some of those white cloth napkins with aqua trim. Also, my friend Rhonda from Hallstrom Home has an online store at Hallstrom Home where she sells these gorgeous jumbo sea glass beads. 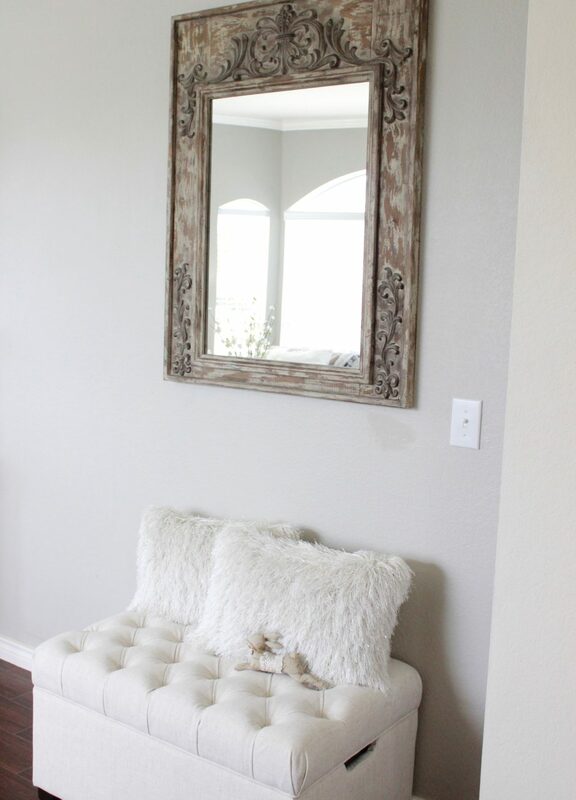 They so nicely compliment my Beach Glass Ruffle Throw Blanket on this tufted chair. You can find it HERE in my online shoppe. And there’s my little bunny fwend, ha! I said subtle, didn’t I?! But I think he looks so cute under all those cherry blossom stems. I switched out the green leafy stems for these and I’m definitely loving the feel of Easter in this room now. Ok, so that’s one way to style this area and add some pops of color for Easter. Now, how about this…. If you’re a regular reader, you KNOW how I just LOVE pink! 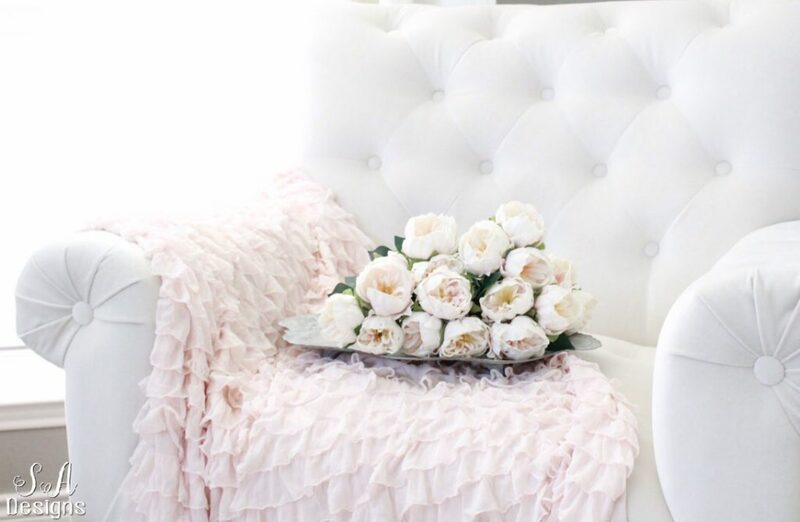 Pink, blush, bashful, any shade or name…I love it all. So blush felt like another perfect color for this Easter Parade. I kept the white cherry blossoms instead of using pink ones because I had those lovely peonies that I mentioned earlier. 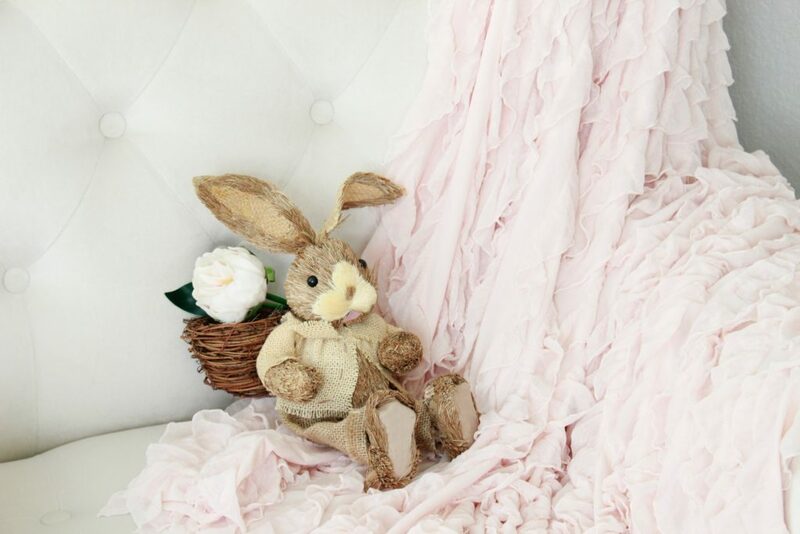 The Blush Shabby Chic Ruffle Throw Blanket HERE is also from my online shoppe. When showing off my peonies last month, I also decided I wanted to bring the blush back in here for Easter. 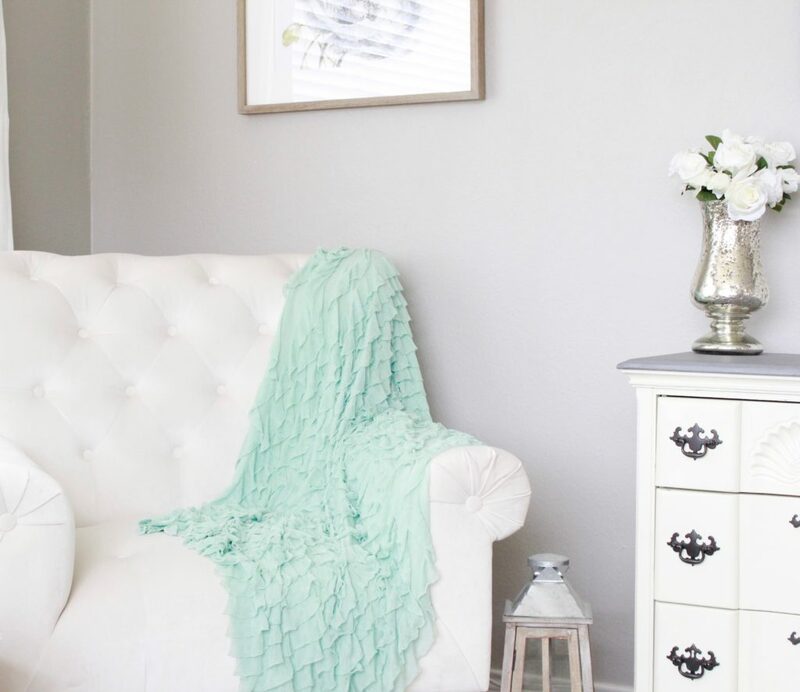 As I love to change things often, it was the perfect companion to my beach glass-colored throw. 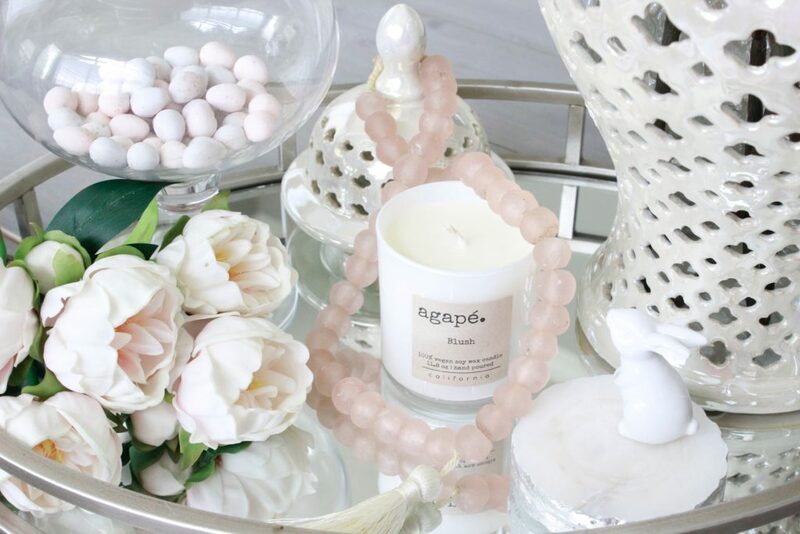 Do you see those mini Cadbury Eggs in the apothecary jar? They’re my favorite. I swapped out the wrapped mints for these and picked out the blush and white ones to put in the jar. Speaking of companions….my friend Rhonda also sent me another pair of glass beads and these were the blush glass beads. I absolutely love them! Aren’t they just gorgeous?! Then there’s this candle….. Oh mercy, it’s sooooo soooo good. This comes from my talented friend, Rachel, who I just adore and she makes the most fabulous candles. 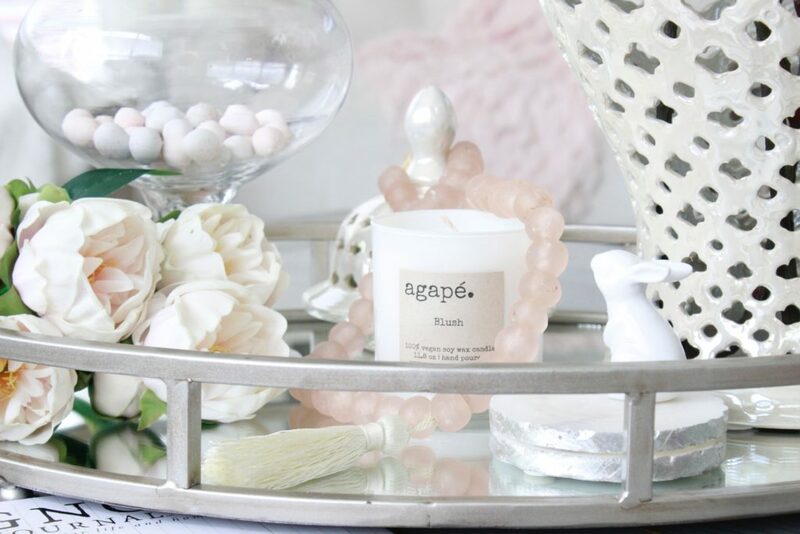 She opened up her Etsy shop HERE where she sells her Agapé candle line that she created last year. I love candles but I’m picky about candles. I’ve fallen in love with Rachel’s soy candles and have tried several of them and loved them all. 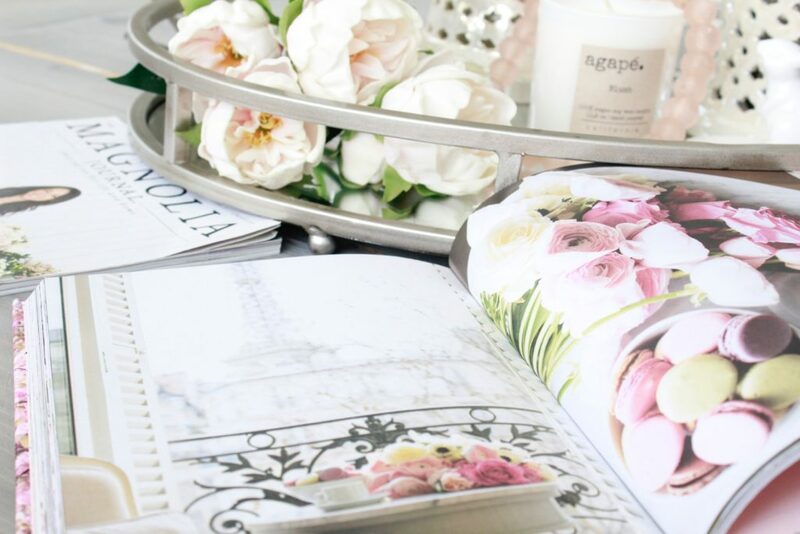 But her latest scent “BLUSH” is sooooo dreamy and I thought it was a perfect visit poster’s website addition to my blush Easter decor in the family room so I had to order one of them as well. And I think my little bunny agrees, as he looks toward it. As we are moving from Texas to Washington state at the end of this month and building a home there, we are in the garage deciding what to keep and what to throw out. I do this every year or two when we move (yes, we have moved a lot but this time it’s permanent), but this time I really want to get rid of a lot and start fresh in the new home. In doing this, I’m afraid my dear hubby might have tossed one (of our many boxes tossed) Easter box accidentally that wasn’t in a large Rubbermaid container. I’m cringing and I can’t find it anywhere. But at least I found a few more bunny fwends to put around the house. This guy is pretty cute. Easter is a time of newness and rebirth. It’s a time of celebrating the resurrection of our Savior. So I love anything floral and blooming. 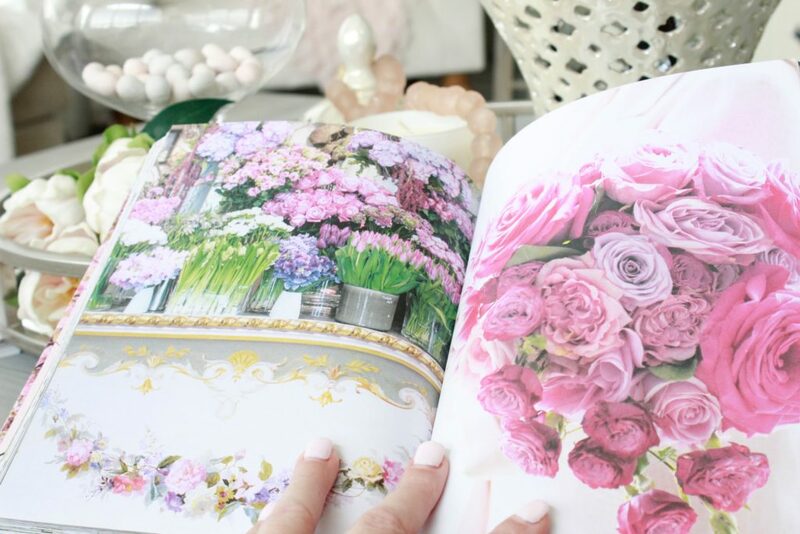 I found those most darling Magnolia Magazine in the supermarket all about floral. 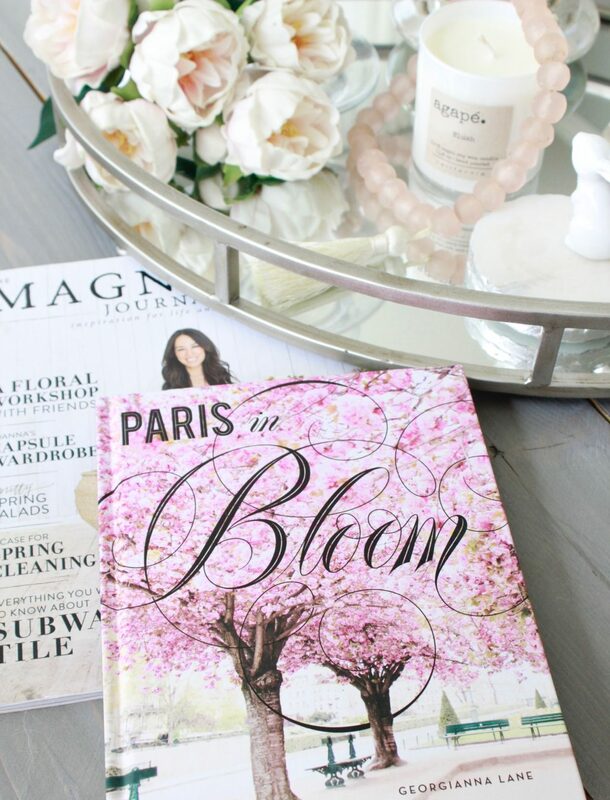 And then a dear friend of mine, Georgianna Lane, published another book called Paris in Bloom and it’s just breathtaking and the most perfect book to have on my coffee table this Spring. It arrived just in time for Easter. I can’t wait to give it to my friends and family for gifts. Every page is so gorgeous! I’m loving all of those Easter tulips. Can you just imagine what a dream it would be to go to Europe during the Easter season? There are so many fresh tulips and cherry blossoms! and just one sweet bunny. Over on my buffet, I created just a little glittery fancy Easter vignette. 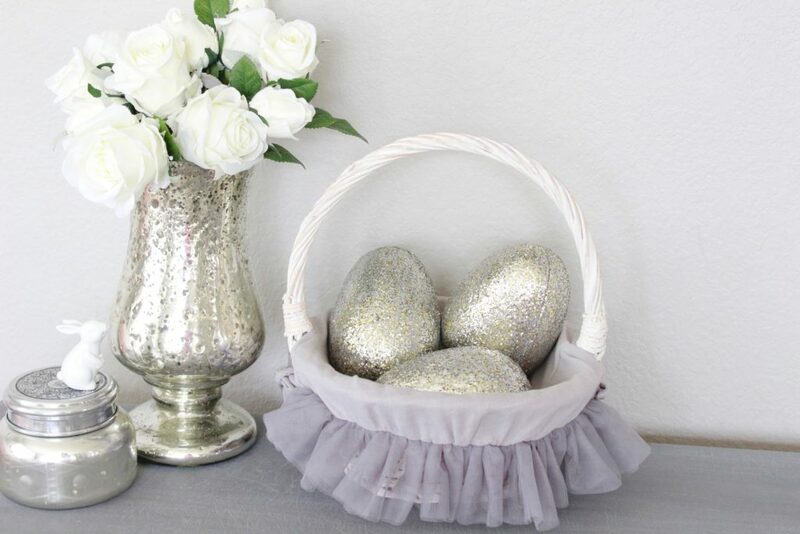 I found the pretty Easter basket at Home Goods and they were perfect for my wooden glitter eggs that I found at Pottery Barn Kids last year. I have a fun idea for those for my kiddos. Over in my living room, I added green and white faux hydrangeas to my mercury glass compote bowl and another adorable bunny. 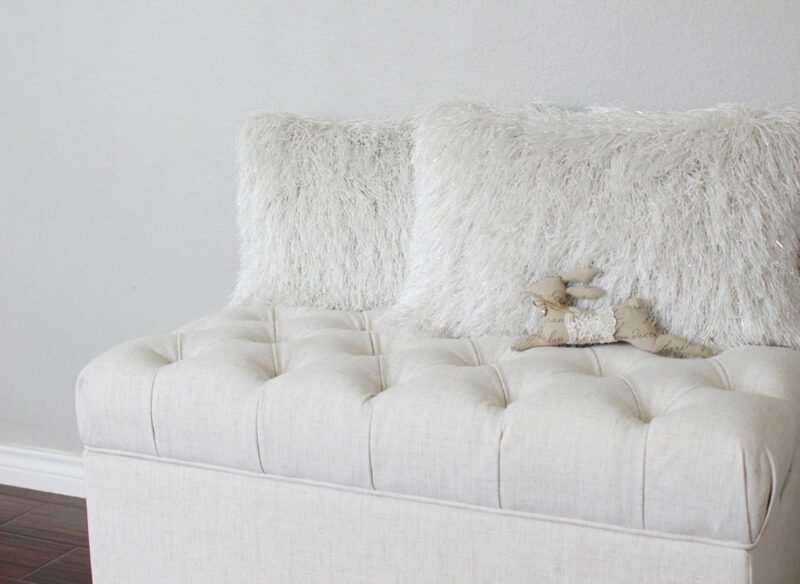 It’s subtle and simple but keeps this space looking elegant and not cheesy. I love how fresh this room feels. I love all the blossoms and green. These stems here are from one of my recent trips down to Magnolia Market in Waco. Doesn’t it just feel like Easter without having to step outside?! In the Dining Room, well….you’ll have to come back tomorrow for that one. I’ll be joining another group of friends to share what fun crafts we came up with this Easter. 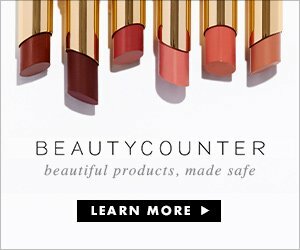 Here are some shopping links for things you’ve seen in this post, to make your shopping experience more convenient. I would also love it if you subscribed at the top of the page in order to receive my weekly emails of all my latest posts and hear about your next month’s calendar or freebies. You can also follow me on Instagram, Pinterest, and Facebook to see what I’m up to in creating a home and lifestyle of inspiration! I hope you’re enjoying your Spring! I just love your house in Spring! 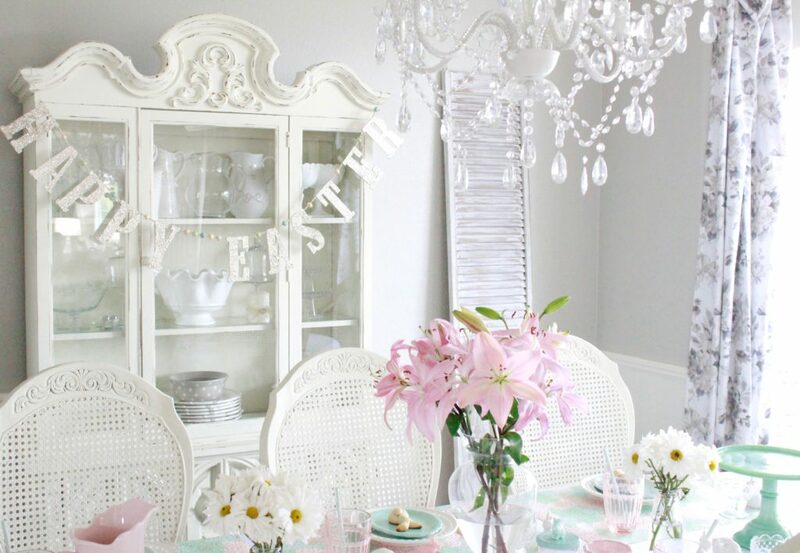 Of course, with all your white, the pastels look so pretty! And I adore those glittery Easter eggs – definitely up my alley! And that book! Wow! I didn’t know you knew her, I’m such a fan of her photography! I’m going to go get the book right now – so gorgeous! Summer, your home is always beautiful, but in spring it just really glows! 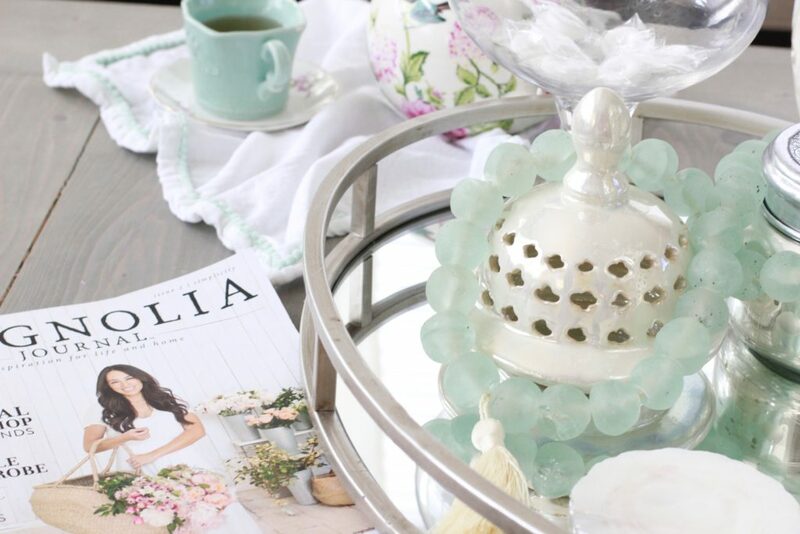 I love the soft aqua and blush touches – equally pretty!! Love all the pastel spring colors! Everything looks so crisp and clean. I love that! ! So beautiful!! Beautiful spring designs! 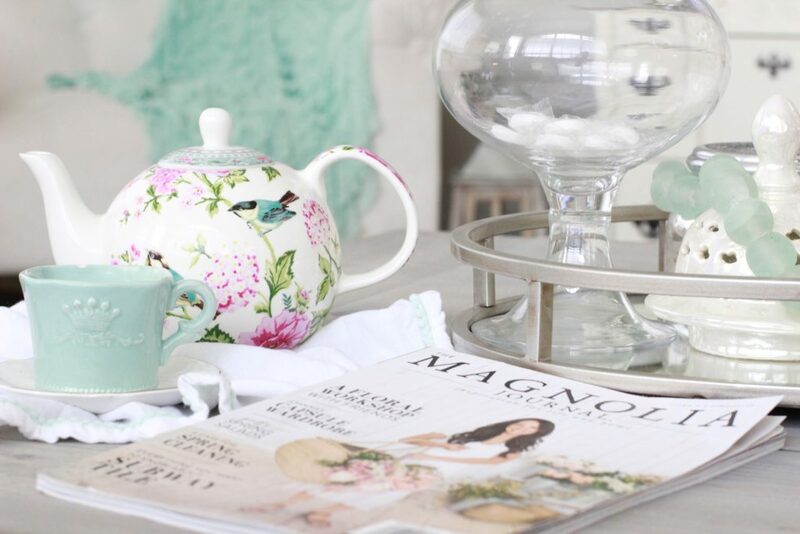 Love that fun teapot and those mint colored glasses. You always have such beautiful designs! I just love the seaglass beads and your adorable Easter bonnet! 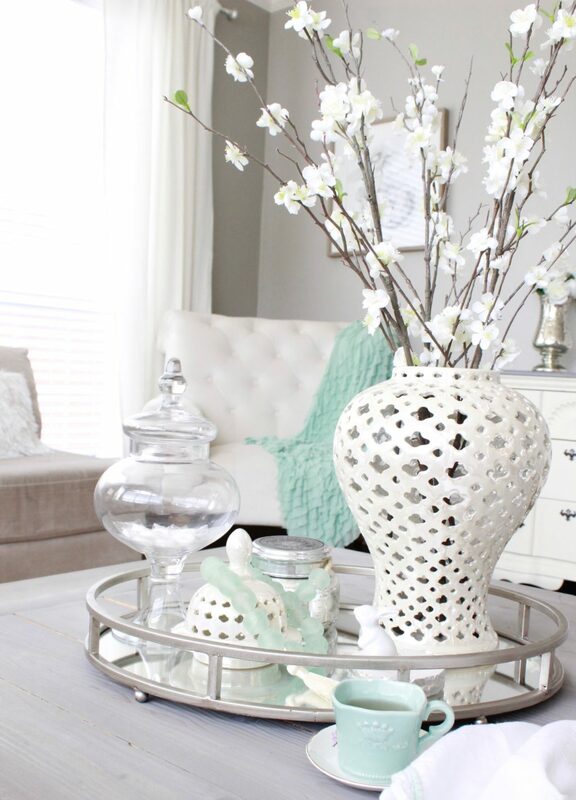 Your subtle pastel colors are so inviting and scream Spring Bring on the blooms for sure! my fav were the glittery easter eggs. I also read through your kid easter activity post. The bunny footprints were so fun. Well thanks a ton Mysha!! I appreciate you stopping by. Weren’t those glittery eggs just gorgeous?! I wish I could find more this year but nobody has them. I liked the bunny prints too LOL… Everyone in the neighborhood has noticed them ha! Summer, You’re such an inspiration always! Love the pastel color schemes, can’t go wrong either way. the sparkle eggs are adorable! always love “hopping” with you!